Neptune's brings heaven to earth. It's everything that that is subtle, intangible, and ethereal. It's dreams, schemes, and magical, mystical things. Neptune causes illusions, delusions, and deceptions. It alters your reality and blurs boundaries. Neptune's purpose is to teach you the oneness of all. 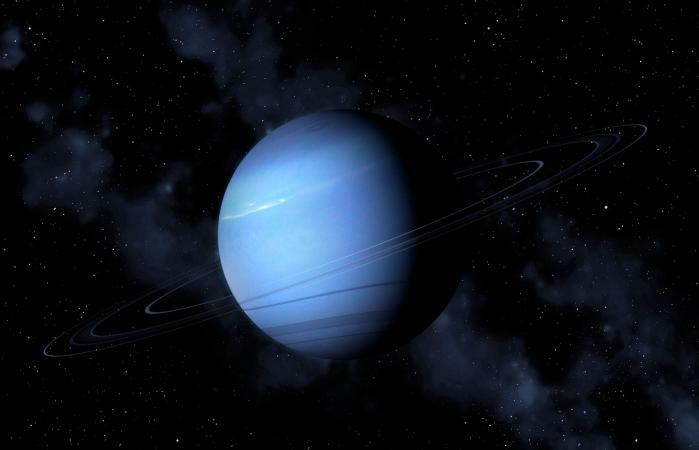 The planet Neptune was discovered by mathematical calculations based on its gravitational pull on the orbit of Uranus in 1846 and was only seen through a telescope later. It has a cloud cover with a vivid blue tint and dark vortices coast through its atmosphere. Like Uranus, Neptune has an off-kilter magnetic field. It has an oval-shaped orbit and every 248 years Pluto moves inside Neptune's orbit for 20 years or so. Named after the Roman god of the sea, Neptune is the modern ruler of Pisces, the natural ruler of the 12th house, and is considered the higher octave of Venus, i.e. acceptance and unconditional love of all that is. Neptune, along with Uranus and Pluto, is a Transpersonal Planet that takes you into realms that are beyond rational, logical understanding. Neptune connects you with the divine. Neptune is the planet of inspiration, dreams, illusion, and fantasy. It intensifies your sensitivity and intuition, clouds your perception of reality and deepens your compassion. It's the planet of the arts and relates to photography, film, dance, music, painting, and poetry. It rules drugs, both those that heal and those that alter your reality. 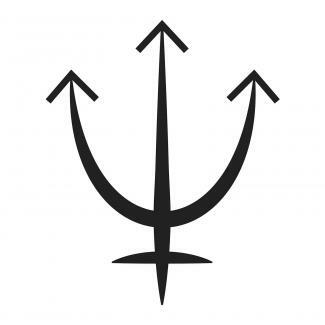 Neptune's symbol (♆) is a trident made of a receptive crescent pointing upward for spiritual receptivity, resting on the cross of matter. This glyph symbolizes the soul's yearning to break free from the limitations of matter and earthly existence. It takes about 165 years for Neptune to circle the entire zodiac and it spends approximately 14 years in each zodiacal sign. Due to its slow movement, the sign placement of Neptune is shared by people of the same generation. Which means the house it occupies, the aspects it makes, both natal and by transit, to all the planets and points in your birth chart are what astrologers consider more than the sign Neptune occupies. You can find astrological sign placement and house placement of your Neptune with the free natal chart generator on Astro Seek. The sign your Neptune was in when you were born shows the spiritual mission your generation has undertaken. The Neptune in Aries generation knows that what each person does affects others and their spiritual mission is in right actions and infighting to easing the suffering of humanity. The Neptune in Taurus generation has visionary ideas about money, material resources, and the natural world. They are spiritual seekers of the "Garden of Eden." The Neptune in Gemini generation has extrasensory perception, and their spiritual mission is to connect with the great beyond and bring back divinely inspired communications. The Neptune in Cancer generation is sensitive and emotionally impressionable. They seek bliss in empathetically caring for others. The Neptune in Leo generation is aware of their inner divinity and uniqueness and seek bliss by listening to their hearts and giving unconditional love. The Neptune in Virgo generation is aware of the need for perfection and are on a mystical quest for self-love and purity of mind, body, and soul. The Neptune in Libra generation has a spiritual love of beauty and harmony. They are idealistic in relationships and seek divine bliss in friends and lovers. The Neptune in Scorpio generation has deep feelings and undercurrents. They are on a spiritual quest to find the beauty in what's hidden and ugly. The Neptune in Sagittarius generation is filled with visions and imaginations. They are on a spiritual quest for knowledge, wisdom, and experiences that expand both their senses and their spirit. The Neptune in Capricorn generation is both practical and idealistic. Their mission is to bring the spirit or ideal into forms and structures. The Neptune in Aquarius generation is spiritually aware. Their mystical quest is for a utopian society and the acceptance of all of humanity. The Neptune in Pisces generation has rich imaginations and a greater sense of charity. Their mystical quest is to inspire greater feelings of oneness and greater spiritual awareness in all. Wherever Neptune is in a birth chart, there can be idealistic and artistic tendency's, but it can also be an area of life where you wear rose-colored glasses, don't see clearly, and want to escape from reality. Taylor Swift's Neptune is in the first house. She projects a glamorous and sparkling image (1st) that has a magical quality which allows her audience to believe she belongs to them (Neptune). Oprah Winfrey has Neptune in the tenth house. Her public image (10th) is inspiring, magnetic and imbued with her imagination, inner vision, and spiritual callings (Neptune). In relationship astrology (synastry), Neptune contacts can give compassion, empathy, and romance to a relationship. It allows you to cherish and sacrifice for the one you love, give them unconditional love, and see only the most beautiful and best in them. However, Neptune contacts can also mean illusion, deception, co-dependence, and disillusionment to a relationship. Much depends on each's entire birth chart as well as the couple's maturity. Do you sense you've entered a world of smoke and mirror or gauze and glitz? Do you feel alone and abandoned, lost at sea in a low-lying fog? Are you confused, disoriented and longing to escape this harsh world? Then you are probably dealing with a Neptune transit. When Neptune enters your life, things become slippery and difficult to grasp. You experience other realities, have mystical visions and epiphanies as you are drawn to embrace your spiritual life (no matter what form spirituality takes in your life). Your life becomes empty and uncertain. You're confused and disoriented. During a Neptune transit, you may feel drawn to seek escape in drugs, alcohol, or excessive media exposure, etc. as a way to disconnect from your feelings and escape your problems. You're more likely to be deceived due to a temporary inability to discriminate between fantasy and reality. And you're prone to sacrifice yourself as you become overly empathetic and sensitive to others. By transit, Neptune dissolves what it touches, like the ocean, it ebbs and flows and over time reshapes your life. Neptune transits can last 2-3 years. During that time, Neptune slowly washes away what needs to leave your life. However, if you are unwilling to let go of your earthly attachments, Neptune stirs up the waters causing tidal waves that can bring greater loss and destruction to your life. Transiting Neptune often brings first-time clients to a professional consulting astrologer. The gift of Neptune is to set you free from earthly attachments and when Neptune is successful, you're rewarded with empathy, psychic ability, and artistic creation. 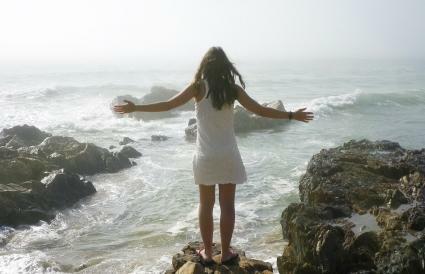 Neptune's ultimate desire is the realization of your own divinity.